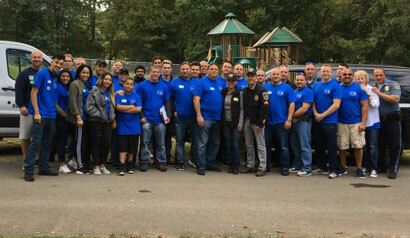 Photo Caption: The Berkeley College community provides the Woodland Park Police Department assistance at an “International BBQ” held at Zaccaria Park in Woodland Park, NJ, on September 30, 2017. The event gave Woodland Park residents a chance to engage with local law enforcement officers while enjoying international cuisine and family-friendly activities. Many of the students who volunteered during the day are majoring in the Justice Studies – Criminal Justice program at Berkeley College.